This work has become an English-Pali Dictionary of considerable size. To cover the whole English language is an enormous task, and to find our Pali words for nimerous modern concepts is extremely difficult if not impossible. I had to coin many words for new things, and sometimes I had to give more than one Pali word for some English verbs which do not exist in the ancient languages like Pall. As this is only a first attempts it will not be surprising if anyone fmds short-earnings here too. THE publication of an English-Pali Dictionary is a notable event in the life of the Pali Text Society; and when our friend of long standing offered this work to us we gladly accepted the privilege of publishing it in the conviction that, although the compiler had had to face a task entailing a number of peculiar difficulties, he was extremely well qualified to do so, having devoted his life to a close and deep study of Pali. It is now thirty years since the Pali Text Society issued its Pali-English Dictionary; this has been twice reprinted in order to meet a constantly growing demand for the aids and means to study Pali and its sacred literature. The time is already ripe to add an English-Pali Dictionary to the Society's song list of publications, and indeed the need for one has been felt for some years. For, although the Venerable Widurupola Piyatissa. Thera's English-Pali Dictionary has much to commend it, its usefulness is reduced for the English-speaking world by the Pali words being given in Sinhalese script. A publication issued by the Pali Text Society must, on the other hand, follow one of the original objects' of the Society: that publications be in roman script. 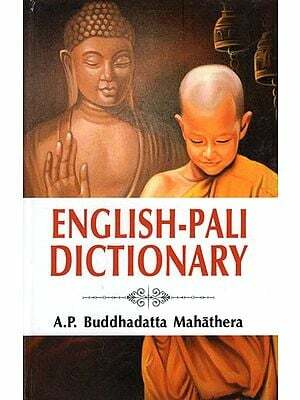 That this present English-Pali Dictionary has been compiled by the Venerable A. P. Buddhadatta Mahathera, Agga-mahapandita, will guarantee the scholarly way in which it has been handled. For he is a grammarian and well known as the author of several Pali grammars written both in Sinhalese and in English; and moreover he has edited Sammoha-vinodani, Saddhammapajjotika (3 vols. 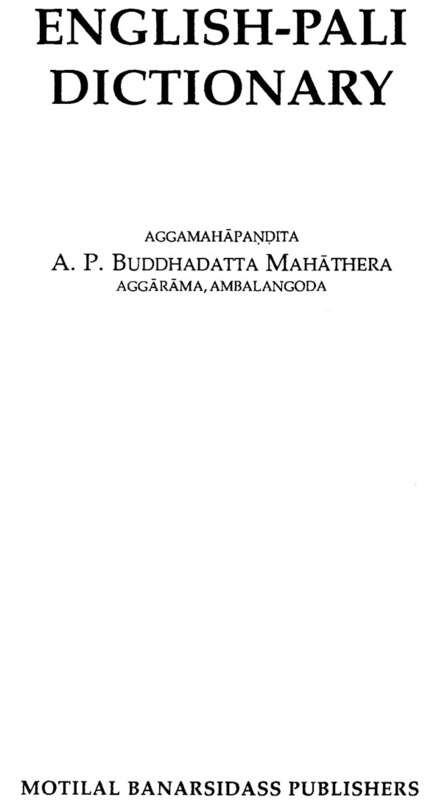 ), Buddhadatta's Manuals (2 vola.) for the Pali Text Society, as well as other Pali works published in the Society's Journals. A Dictionary of the entire English language, each word with a Pali equivalent, would perhaps be impossible; and it would certainly not have been desirable since any such compilation would attain inordinate length, whereas what is more needed is the presentation of as much useful and well chosen material possible in one volume of a manageable size. It would be impossible, for Pali could not be expected to produce words, for example for plants and birds of a non-Asian habitat. So there are no entries for such things as ' dandelion', 'buttercup', 'honey-suckle' or ', black- bird " so familiar to English people. Tern ' does appear, although' not as a bird but as a set of three, a triplet. Hawk', kite' and , owl ' are however included as well as other birds known also in Asia. Nor have these escaped the notice of the compilers of the Pali Canon and Commentaries, where they are not infrequently referred to. Pali equivalents were therefore already at hand. But if Pali cannot coin all words, the Venerable Buddhadatta has been indefatigable in coining a great many, particularly perhaps for current English anatomical, medical and botanical terms, for other scientific words and for modern inventions, such as ' emplane' (verb), 'telephone' and 'telegram', and for which Pali proves very well adapted. This is not altogether surprising for, although it has long been a static language, it yet covers a wide range of thought, enriched by hundreds of narrative .stories on a variety of topics and by a multitude of similes drawn from everyday life and things. Another class of omissions that had to be made concerns certain, but not all, words that are narrowly" ' ecclesiastical' in usage or , classical' in reference, such as ' Chasuble' and' Doric ' (architecture), and which fall outside the scope of Pali thought. On the other hand words are included that would not normally find a place in a purely occidental Dictionary . We may give as examples ' Tooth-relic' and 'false view', words which, in their technical sense, are not of the common stock of European thought, but they have a decided technical meaning in Buddhist literature. 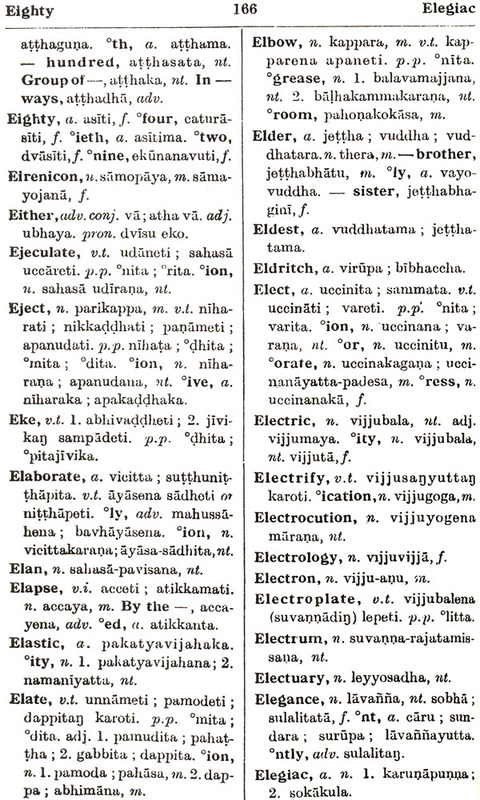 As it is hoped that one of the main uses of this Dictionary will be to provide a further instrument for the study of' Pali literature and language, words such as these clearly could not have been omitted ; they are part of the very fabric out of which this literature and language are built. All first attempts must in time be superseded, as the Venerable Buddhadatta has intimated in his Preface. But that time will not come immediately. For even although everyone may not agree with all the Pali equivalents given, whether they have been freshly coined or composed from words already in Pali usage,. I yet believe that the great majority of these equivalents will be found to be precise and apt. I also believe that this English-Pali Dictionary, which I hope will meet with every success, is, both on account of its own intrinsic value, and because it is breaking new ground, an important and welcome contribution to the field of Pali studies. In the preface to my Concise Pali-English Dictionary, which was published in 1949, mention was made of the fact that I was preparing an English-Pali Dictionary. I compiled a concise English-Pali Dictionary during the second World War. While its printing was delayed through more than one obstacle, there appeared an English-Pali Dictionary by the Venerable W. Piyatissa Nayaka there in the latter half of 1949. In this work the Pali words are given in Sinhalese script; the gender of the nouns is not defined by designations, but they are given with their different case-endings of the nominative, like rahado, kanta, pallalan and so on. The adjectives also are given sometimes with the masculine case endings, but occasionally with the neuter case-endings. For instance, Lacteal, Lacunal, appear on page 365 there. An adjective in Pali takes all forms of gender according to the gender of the qualified substantive. To cite adjectives in that manner would naturally lead to confusion in the student's mind. They should have been given without any case-endings. Although there are many short-comings in his work the Venerable Elder is to be congratulated of embarking on such a bold venture in spite of his poor health. Under these circumstances the necessity of a well-arranged English-Pali Dictionary in full Roman script was still there. Therefore my friends urged me to re-write my work on an enlarged scale, which I agreed to do. Thus this work has become an English-Pali Dictionary of considerable size. To cover the whole English language is an enormous task, and to find out Pali words for numerous modern concepts is extremely difficult if not impossible. I had to coin many words for new things, and sometimes I had to give more than one Pali word for some English verbs which do not exist in the ancient languages like Pali. As this is only a first attempt it will not be surprising if anyone finds short-comings here too. In compiling this work I benefited from the preliminary advice and help offered by O. H. de A. Wijesekara, M.A., PH.D., Professor of Sanskrit, University of Ceylon. In the course of my work I had to request Miss 1. B. Homer; M.A., the secretary to the Pali Text Society of London, and the well-known translator of the Vinaya texts, to help me in the task. She gladly consented to read the proofs and correct where it was necessary. I received much help from her in defining the exact meaning of some English words and in deciding which words are now not in use though they still appear in some English dictionaries. So' I removed many archaic words some of which are often found in the work of the Venerable Piyatissa. I am sorry to say that I could not carry out all of her instructions as I could not sometimes get her corrections in time owing to my being away in Burma for long periods. I am greatly indebted to the Pali Text Society for undertaking the publication of this work. The Society now has to its credit not only a Pali-English Dictionary but also an English-Pali Dictionary of medium size. It is left to future scholars to compile an exhaustive English-Pali Dictionary. The printing of this volume has been done by Messrs. Colombo Apothecaries' Co., Ltd., with much care, for which my thanks are due to them. It should be noted that Pali verbs cited here are given in the' Third Person singular of the Present Indicative. Their respective Past Participles appear after such verbs. In giving the Past Participles it was found necessary in some instances to give them in compound form with the addition of certain nouns; this need arose when there was no single Pali word exactly parallel to the English verb. For example, the English verb Forge is translated here kutavidhanam karoti, and its P.P. is given as katakutavidhana. Actually this latter is a compound noun, only its first member is a P.P., but, as explained above, it was found convenient W place these too in the category of the Past Participles. There is some difference in defining Transitive and Intransitive verbs in the two languages. For instance, Forget is given as a v.t. in English dictionaries, but the Pali verb of the same meaning is reckoned as an Intransitive. It is to be noted that the definition of verbs given here is according to English dictionaries and not after the Pali grammars. This variance exists only in very few instances. In the Pali-English Dictionary of the P.T.S. stems of some Pali nouns, such as satthar, pilar, and brahman. are given with consonantal endings. I did not follow this method as none of the Pali Grammarians has accepted it. They have given them as suttku, pitu, and brahma , respectively. The secondary derivatives ending in -ui, such as dakkhata, dham- mikata, have their neuter forms ending in tta or ttana, but for the sake of brevity only one form, either ending in -ta or -tta is given in one place.